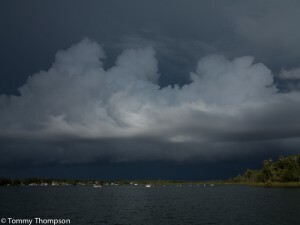 a WORD about WEATHER while on the WATER! Don’t get me wrong, but Florida can have some nasty weather. It can be bone-chilling cold in the winter months. And it can be swelteringly (if that’s a word?) hot in summer. However, summertime is the time of year that tropical depressions–and even tropical fronts–can bring lightning down on the heads of unwary and unsuspecting boaters and fishermen. My “Rule Number One” is to ALWAYS take a look at the weather map and to understand the trends that lead up to bad weather. In summer, if it rains and storms one day and there’s no official Tropical Depression, Tropical Storm, or Hurricane in the news or on the big maps, it likely will rain and storm for day–at generally the same time each day. A look at the Intellicast website for your specific area (or for the area to which you’re heading) is a good idea. If it looks like this, stay at the dock. A typical summertime afternoon storm crosses Florida's Big Bend! Another good “Rule” is to look in the general direction you’re boating, and if the sky’s black, and it’s not nighttime, change your course. If you have radar, you can sometimes find a hole between squalls, but don’t be suckered into the maw of a storm thinking you can outrun it. It’s sometimes better to anchor up or seek shelter ashore rather than run from a storm. Summer storms are often small in diameter, and will pass quickly. If you have a smartphone like Apple’s iPhone, a good radar “app” is Weather Bug. It gives you good radar information, and is free. All you need is cell phone service, which is available at your APP store. You'll likely have a few minutes notice before a big storm like this one hits. Take cover, if possible, under a dock or bridge. Or anchor up and get all your geat and crew down. 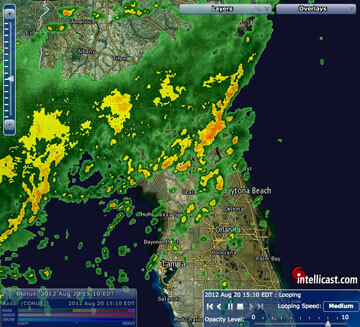 And speaking of anchoring up and waiting-out a big storm, be sure to take all your rods and antennas down. You don’t need any lightning rods on your boat. And if the lightning gets close, have your crew lay down in the boat, away from any metal parts. And for sure, don’t let anyone fish!